Yes, the charming celebrity room I’m featuring today is a bathroom…but what a unique master bath. It is found in Max Mutchnick’s Beverly Hills tudor mansion (that once belonged to tennis legend Pete Sampras). Mutchnick is writer, and co-creator of the hit series Will & Grace. This charming master bathroom is a statement of luxury. 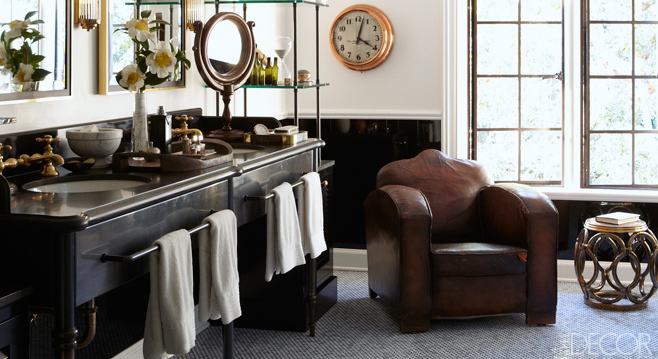 It features a custom made vanity, a brass stool and an English club chair; all vintage. The clock is from the Associated Press newsroom. The gorgeous glass tiled floor was created by Waterworks. Photo: William Abranowicz for Elle Decor. This entry was posted in Celebrity Homes and tagged Celebrity Homes, celebrity rooms, charming rooms, decor, Elle Decor, interior design, interiors, luxury, luxury bathroom, Will & Grace. Bookmark the permalink. I love this! Who would ever think to put a comfy leather chair in a bathroom? How unique! I could live in this bathroom! Seriously.